Starting as man brings his 10 year old son Daniel to the Cemetery of Forgotten books one morning in 1945 and ending as Daniel takes his own 10 year old son Julián there in 1966, this cyclical story links the lives of two sets of people living in Barcelona across the ages via the book Daniel finds in The Cemetery of Forgotten Books. 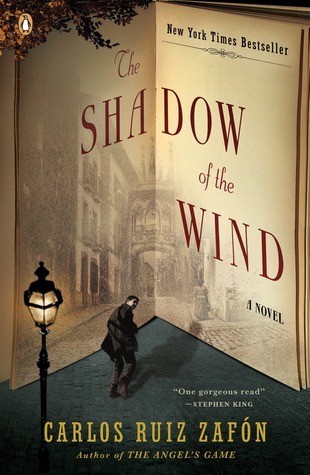 “The Shadow of the Wind” is written by Julián Carex, whose own life, his love for Penélope, his friendship with her brother Jorge runs in a parallel trejectory to those of Daniel, Beatriz and their Julián, along with loveable rogue Fermin, and Beatriz’ brother and Daniel’s friend, Tomás. The book itself is not the only link, as one man’s hatred is also following the book’s trail and as Daniel tries to uncover the story behind it and its mysterious author he inevitably clashes with him, Inspector Fumero. There are so many parts of this multilayered book where the story hits you hard SPOILER eg the revelation of what happens to Penélope is as graphic as it is awful, how jealousy drives Fumero obsessively, feeding his same demented persona that became an assassin in the Civil War and then rose to the ranks of Police Inspector where he continues his bloodthirsty shady tactics, how grief consumes people and in Julián’s case to the point of destruction of self and work. The section which is Nuria Monfort’s letter revealing the details to Daniel is in my opinion the best written section of the book, it flows beautifully and builds up the book’s momentum when it had lulled a little. Having recently read Zafón’s Mist Trilogy and Marina, it is easy to see how his craft has developed and how his ideas are interplaying – his interplay of light and shade of fire and shadow, as is his typically Spanish concern with their Civil War and its aftermath. ashramblings verdict 4* Loved it, a real page turner. With the winter approaching, this is one for your fireside reading list. I just saw that there will be a 4th book in this Cemetery of Forgotten Books Series, coming out this year in Spanish and in 2018 in English. Can’t wait.